Real Escapes Properties proudly offers Sea Spray Cottage! 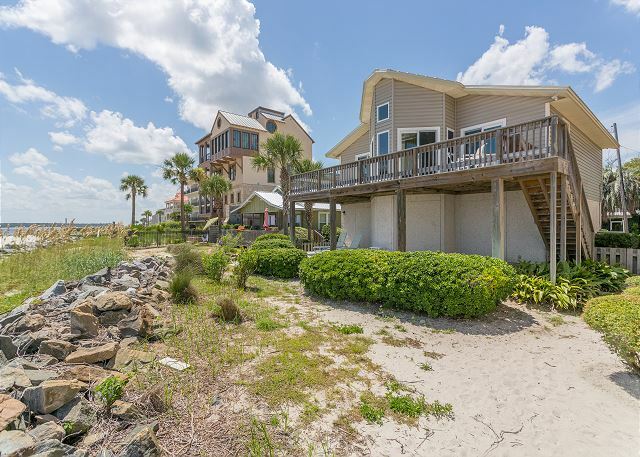 With so few ocean front beach cottages available, you will surely enjoy this one-of-a-kind ocean front property. 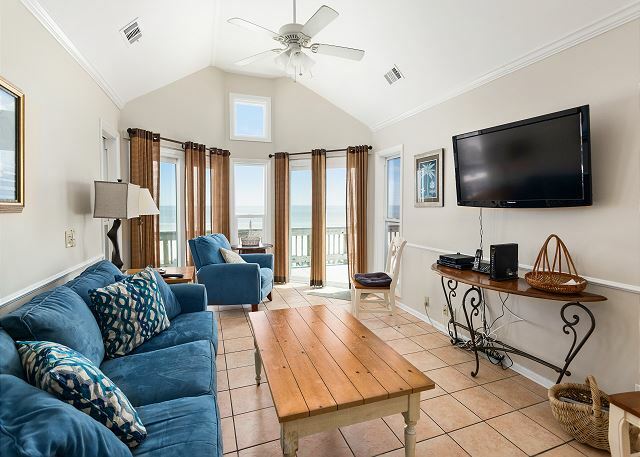 This amazing two bedroom, two bath home offers spectacular direct ocean views. When you first walk into this adorable cottage, you are greeted with relaxation in mind. Tastefully decorated, the den and eating area are quite spacious for the square footage. Plenty of room to watch TV or read the latest novel. The kitchen is nicely updated and you will find everything you need to prepare scrumptious dinners for your family. Don't forget - our area has some fantastic places to pick up the freshest seafood! 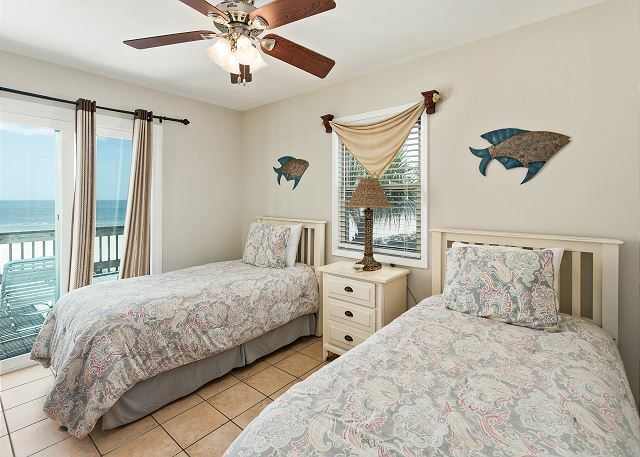 Bedroom #1 is a comfortable master bedroom with King sized bed that beckons you to snuggle up for a nap after a busy day at the beach. It comes equipped with a television as well. 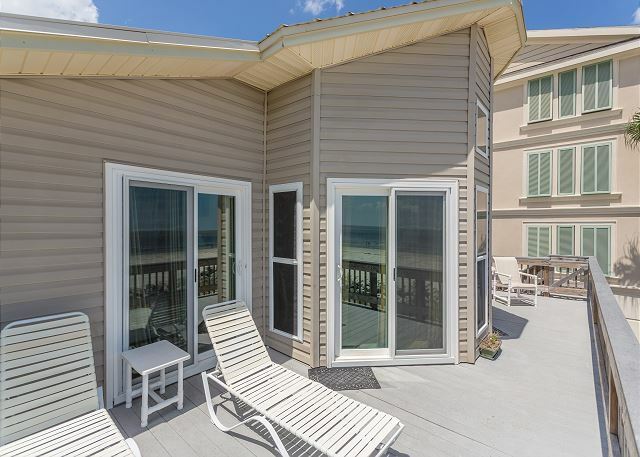 Don't worry - you can still see the beach through the sliding glass doors! 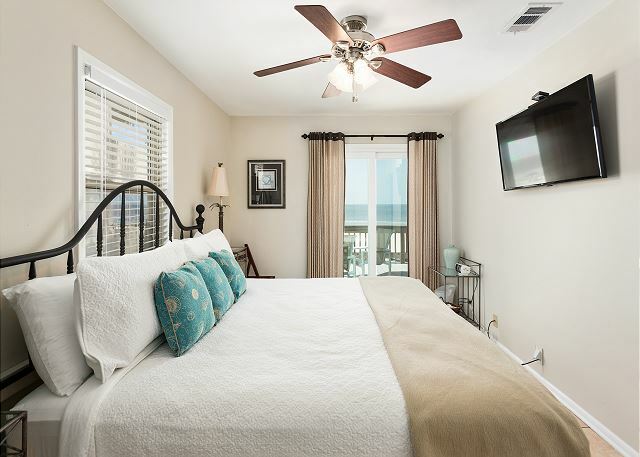 There is an en-suite master bath that is connected to the bedroom by a large walk-through closet Bedroom #2 has two Twin beds with a mounted TV, but you'll have trouble taking your eyes off the ocean view right outside this bedroom too! 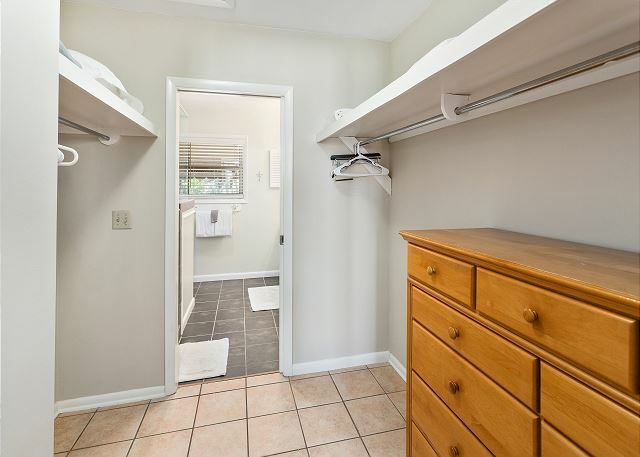 There is a full bathroom that is adjacent to both the den and 2nd bedroom. Although there is direct deck access through the bedrooms, you can also head to the porch through the den. The upstairs deck stretches the entire width of the house. There are lounge chairs and a patio set available. Imagine having your morning coffee on the porch listening to the sound of the ocean. 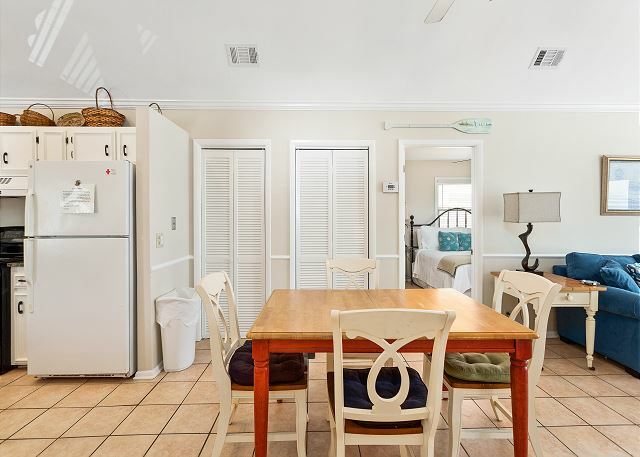 This is the perfect rental with everything you need to have an unforgettable experience on St. Simons Island. * Outside shower area for easy sand removal! 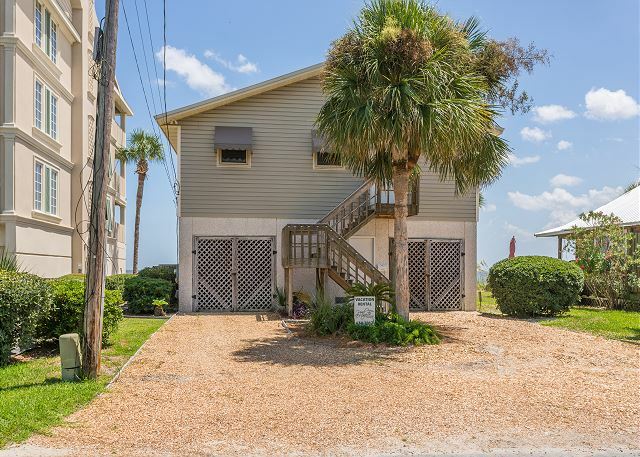 Location: You have your own beach access! Only 1.2 miles to Coast Guard Station, 1/2 mile to Massengale Beach, less than 1/2 mile to the Pier Village Area! Love this place. All it lacks is HBO and high quality culinary tools. This year, had a daily newspaper for the first time - nice touch. Owner makes small improvements yearly. Since we have been coming he has updated furniture, sliding glass doors, grille, knives, washing machine, dryer and dishwasher. If he could just guarantee clear blue skies and 75 degrees daily, it would be near perfect. Wonderful stay at Sea Spray. Great location right on the beach. Our house was great. Perfect location directly on the beach. Highly recommend renting through Real Escape. We have stayed the GA/fla week at this property for the past several years. We originally chose it because it was on the water, within walking distance to the village, and was pet friendly. Even though we no longer have our pet, the charm of this property suits us well. Real Escapes Properties are wonderful. They’re very professional but personable in their business. I always enjoy our chats when we are check in and made arrangements for the next years stay. I recommend them wholeheartedly. 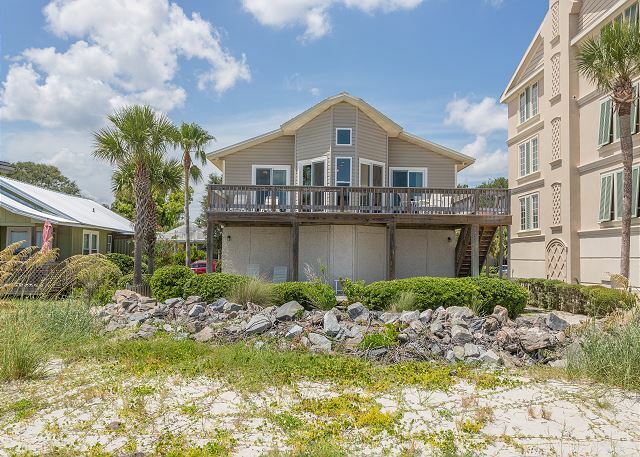 Our favorite rental on SSI! Great location- great kitchen ( we love to cook). Only problem was kitchen faucet on last night we were there. We always enjoy Sea Spray!! 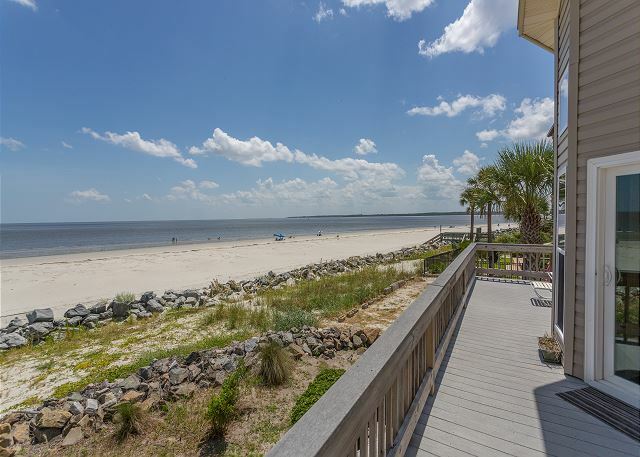 We always vacation in rentals on St. Simons for two weeks every May. A few years ago we became aware of Sea Spray - and now cannot imagine ever staying anywhere else. The spectacular view of the beach cannot be matched. The house is well built and well maintained. Kept very clean and nicely furnished. Absolutely perfect for being at the beach. Quick access to the Village, and yet a sensible sense of privacy. From inside the house, only the ocean can be heard or seen. And to top it all off, our experiences in working with Real Escapes Properties is always, always, first rate. All representatives are consistently courteous, knowledgeable and professional. This was our second year at Sea Spray. Wonderful place on the ocean and a short walk to the village. If I had a wish I would wish for a BBQ and a swing for the downstairs porch. The beds are comfortable and linens are in excellent condition. The kitchen is well stocked with good utensils and a huge selection of pots and pans. The folks at the property management company were friendly and professional. Im already booked for next year. We are repeat renters at Sea Spray and love it. The house is perfect, the staff is wonderful and the property management company was professional. The entire experience was just great. And we really appreciate being able to bring our small dog. Thank you! 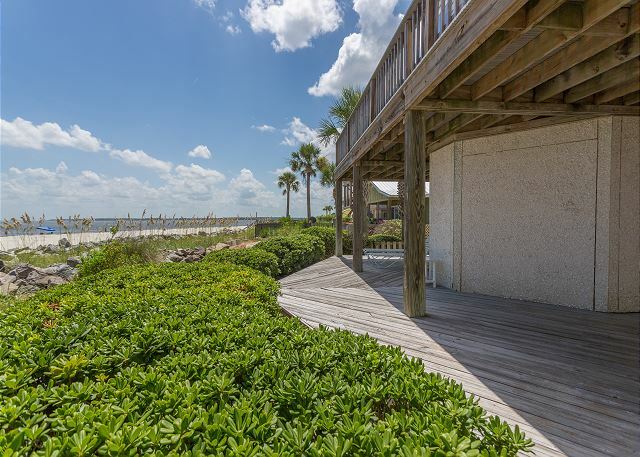 Sea Spray is our FAVORITE rental on Saint Simons! 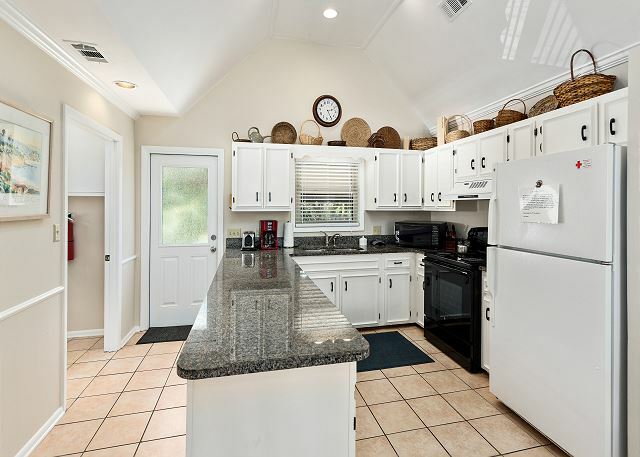 We love the location and sound of the ocean as we relax--and the fully equipped kitchen is a BIG plus as we really like to cook top notch meals while we are there!! First class ALL the way! Long weekend getaway. My wife wanted a beach front home that was dog friendly. This home fit the bill.We and the dogs loved it. We enjoyed the property. The location was fantastic and the rental house was clean and located on the beach. The people at the rental office were very friendly and helpful with recommendations as we were new to the island . This house was just perfect for people like us that wanted to be on the beach and hear the waves! It is a great traditional beach house that was clean as a whistle. Great location to the beach and village. You can charge a golf cart there as well. Both bedrooms have a great ocean view. Deck is wonderful to sit and watch the sunrise or sunset. Kitchen fully equipped. Master bedroom has very updated bathroom. We were able to bring our basset hound also. You can walk to anywhere from here. Good parking also. Highly recommend this house! Five star experience all the way!!! 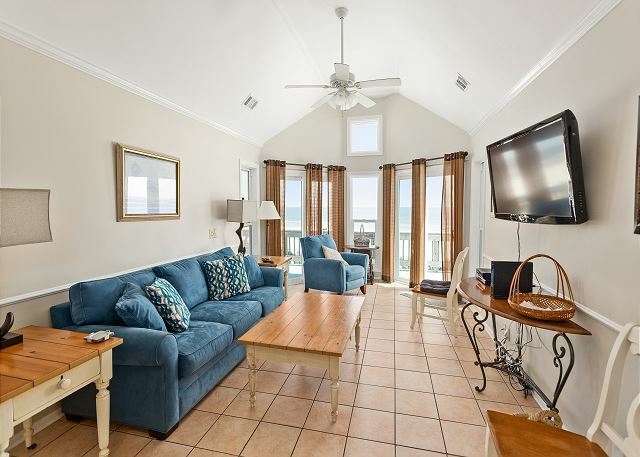 This is a wonderful dog friendly vacation house right on the beach. The deck is set up to contain your dogs and the yard is somewhat contained, as well. I do wish there was a walkway over the rocks to the beach but that was a very minor inconvenience. We go to St Simons every year and I will be reserving this house for next year! This was our six annual stay. We love it, but it is showing some wear and neglect: floors not mopped, all door screens are broken, guest BR patio door wouldn't lock. There was no grille. Inadequate cooking pots and pans. No tv channel guide. Toilet paper was "one ply." A 11 am checkout would be better. We had a delightful experience with Real Escapes Properties. Sea Spray was a wonderful house in a great location. We couldn't have ask for a better vacation! Wonderful property! The view is absolutely gorgeous. The house is clean and comfortable, and we had everything we needed for the week. The only downside is the steps that our dog has to negotiate, but she did fine. Great property! Wonderful weekend. Perfect location and the deck has an incredible view of the beach. Just as advertised. Awesome rental. Will stay again. The house was wonderful equip with everything you need. It was clean and well maintained. As always we had a great stay. The rental staff is wonderful to work with. Right on the beach near the Light House. You can walk down the beach to the Light House and Village. Public access walkways to beach just a few steps away. Parking for cars great. Dishes, flatware, and pots and pans were excellent for cooking. Vista through windows was enjoyable. Porches were excellent. Washer and dryer fantastic. Home away from home. Such a cute cottage. Clean and great location. Real escapes rentals are fantastic! Very pleasant as usual ---- now 6years at Sea Spray and every year so hard to leave and go back to Minnesota. Come every year for a visit with our dog, & we are from Seattle! Great property. The location can not be beat. Inside has a great open kitchen with dinning table between living room. You can prepare meals while enjoying the great view! It also has a large flat screen tv mounted on the wall that is easily moved to enjoy where ever you are in the home. Comfortable couch and recliner with decorator pillows. I love the large deck outside with the lounge chairs. You can enjoy the tranquil sound of the ocean tide. When tide was out this year the beach was large. It had a few more feet of sand come in and really enhanced the beach. I could live here. Thank you for sharing this great property! As always RealEscapes was great to work with. For this visit, while the home was swept out, there were several items not clean. For example, the handle on the pantry door looked dark from years of not being cleaned. Would be great if there was grass or stone steps on the side of the house where the hose is. See you in the spring!! 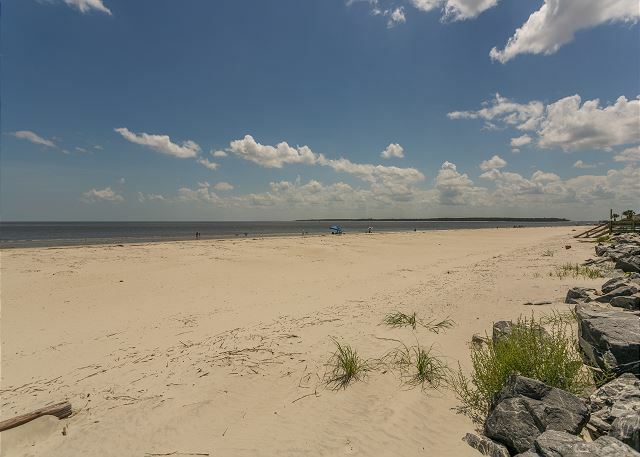 When we arrived in St. Simons Island, we did not have anything booked for our stay. We searched on our iphone and found Real Escapes Properties. They were so helpful and found us a great location and a great price for our vacation. Awesome staff there. The house was great but could use a few updates. The only problem with the cleaning and it may not be the cleaning but the floor itself was that when I took a shower and got ready to put my sandals on, the bottom of my feet were black from walking across the floor. Wore house shoes or sandals the remainder of the stay. Gorgeous view, close to beach access. House had everything we needed for a wonderful vacation. Great stay for a great price! Right on the ocean and private. Close to the village and shops. Only complaint was that we wish we would have known that we needed to bring extra toilet paper, paper towels, dish soap and dishwasher soap. This was our first visit to Saint Simons Island and our first dealing with Real Escape Properties. I found Real Escapes on the internet. At first, I was apprehensive due to a negative review. I inquired anyway and I'm so happy I did! Mary was fantastic from the very beginning, first and foremost, addressing concerns over the negative review posted on the internet. We were traveling with 2 children and our small dog so we needed accomodations for both. Sea Spray was the perfect place for our family vacation. The kids had plenty of room, the home was comfortable and nicely updated. And, the view was amazing! Nothing like going to sleep listening to the ocean waves and waking up each morning to a beautiful sunset...I didn't want to leave. We checked in after hours and everything was exactly as she said it would be. I will definitely call Mary again for our next Saint Simons Island vacation. The is fabulous! When you open the door for the first time you can see all the way thru to the ocean. This was our third summer here. I was happy to see the new furniture and as always it was very clean. The view from the balcony is so pretty. We just love this house. Stayed here for our honeymoon and we came back for our 10yr anniversary and brought our girls. We absolutely love Sea Spray!! Had a great time. The property was a very comfortable place with a great view and beach access. 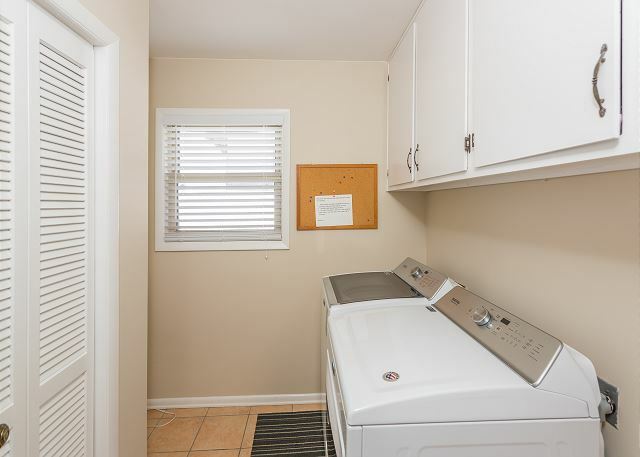 Only issue was with the cleanliness of floor, appliances and some furniture. We took care of that ourselves and it was great for remainder of stay. About a 12 minute walk to the village. Especially enjoyed the ocean view. In the evenings we would watch dolphin pods, a variety of ships and boats, and birds diving for dinner. The house was just perfect!! There are stairs to the second level to enter the house if stairs are an issue. We had a wonderful time. Sea Spray was a great house with a wonderful deck to relax, see and hear the ocean, and watch the boats. Close to restaurants and stores. Highly recommend! Wonderful trip! Could not have gone better. Would definitely stay at Sea Spray again. Beautiful place and great view. We have stayed here years ago with our 2 small poodles. Nice fenced deck on ocean, plenty of chairs ( needs umbrella). Stayed this past October. Wonderful! Clean, great location, great view Our dream home! 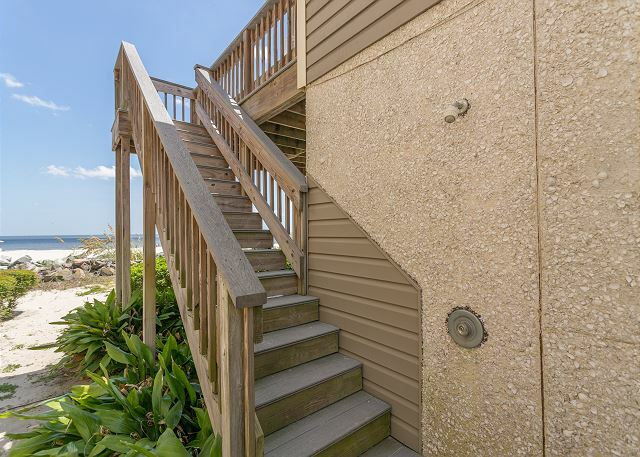 Be sure you can climb stairs for a beautiful view of beach! As the old saying goes, "Location, Location, Location." It more than applies to this nicely done beach house. It was just what we wanted - right on the beach. The photos of the sea view and the interior of the house are very accurate. All the furnishings were very comfortable. It was clean and the fairly recent remodeling was well done. A nice combination of hotel/motel freshness with a lived-in hominess. The staff at Real Escapes was very friendly and extremely helpful. We have recommended the place to a couple of family and friends to look into staying here. (So we can come visit.) My husband does not like to fly, but he said he would, just so he could go back to the Sea Spray. Thank you for a wonderful first visit to the Atlantic coast! "Real Escapes" lives up to its name! As with the three or so times before, it was perfection. Everything, in every way, done with professionalism, know-how, and quality. We had a great time in SSI and the house was perfect. The kitchen has everything you need, always a question with a rental. Have your coffee every morning with the dolphins! We loved the house! It was open and airy, It was very clean and well stocked. We couldn't have ask for a better location. Perched on the edge of the ocean! This rental home was perfect in every way. Sitting out on the balcony watching the sun rise every morning was the highlight of my time in St. Simons Island. So relaxing - so beautiful! one of the things we loved about the property was that it was presumably avsilable to us for the same period every year. we were told this year that the property would not be available next year. we had been kicked out by a long term lease. what more can I say about that. after three years, we have to look for another location. sad. Sea Spray is the loveliest address on St. Simons Island. When my husband and I are planning a holiday, and invite his mother to join us, she says that she'd love to come, and then asks, with a voice full of hope, whether we will be at Sea Spray again. 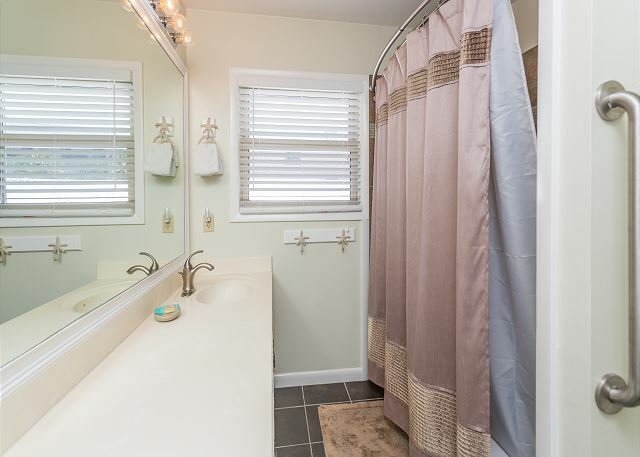 Two bedrooms (one with a recently-added king-sized bed), two baths (one of which is beautifully updated to include a walk-in shower), and a view that is beyond compare. Access the balcony from either bedroom or the living area. There are always bits and bobs in the cupboards to get you started on your visit, and even games for the kids in case you encounter crummy weather on the Island. There is nothing not to love about Sea Spray, and Real Escapes makes the process of reserving it painless. Be sure to visit the office during working hours so that Jasmine the black lab can give you a nuzzle. Five stars from us in every category! As far as accommodations for two, the SSI experience doesn't get any better than this! We loved Sea Spray! It was perfect for the three of us and our dog. The view from all the rooms was amazing. Our dog loved having the beach right at our doorstep. The bathroom was beautiful. We will definitely return next year to this beautiful house! We have been renting from Mary at Real Escapes for many years and she takes care of us very well.This property has a little age but we love the location. Great time as usual.. The house was clean. Furniture could have been more comfortable. The views took our breath away. We could hear the sea thru our screened doors all night. Just wonderful! We were a little disappointed that there wasn't direct access to the Ocean as there appeared to be from the photos, but the view made up for it. Warning: a long staircase to the front door...hard to bring the luggage up. 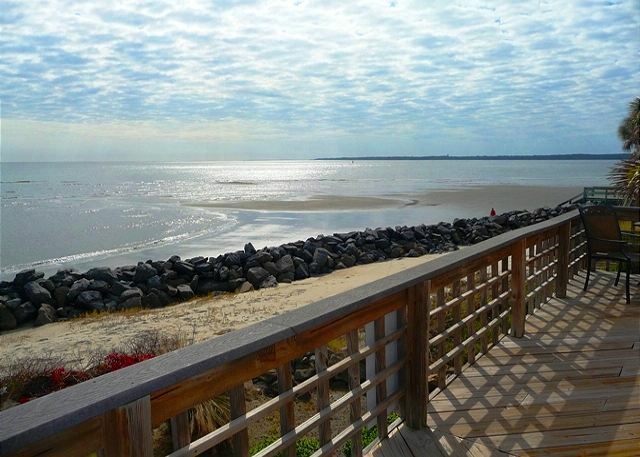 Our stay at St Simons was our first experience on the Island and we loved it. We will be sure to return. The fact that the beaches were dog friendly was great, our Goldent Retriever pup is still recouperating from all the fun she had! Our stay at the Sea Spray on St Simon's Island was the perfect weekend get-a-way. The property was clean, up-to-date, and well maintained and yet still affordable. 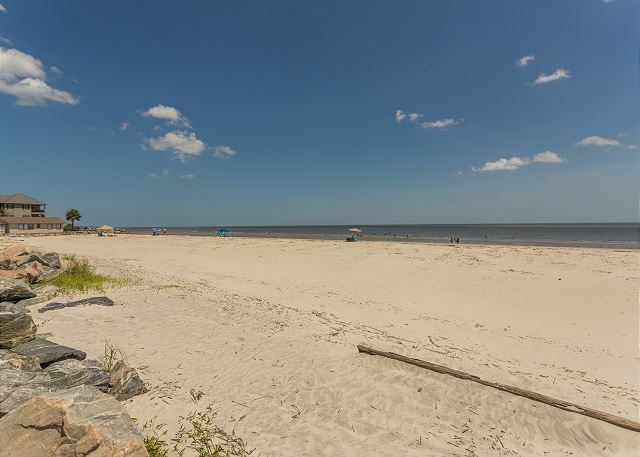 St Simons Island provided us with the perfect combination of sand, sun, shopping, and wonderful restaurants, all within a couple of minutes drive of one another. This is a great house, furnished nicely and in a great location. Watched the dolphins swim by everyday and enjoyed the beach everyday. Highly recommend! My 2 sisters and I thoroughly enjoyed our week at the Seaspray. It was perfect in every way. Living room furniture needs updating. Need to update kitchen cooking equipment. Repair gate on deck. Sod back yard for pet friendly rental. Everything about Seaspray was well worth the trip. The view of the beach was magnificent (there are dolphins out nearly every day), although it could use a bit of an easier access to the beach. My pregnant wife had to trounce across some pretty hectic rocks a couple times a day. Also, there was no grill (despite the welcome package saying there was a grill). And there was a surprising lack of cleaning supplies...trash bags and such. Which wouldn't be such a big deal, if things like that weren't needed to checkout. Overall though, you can't do better...I don't think. It's private and secluded. Plenty of space to veg out. Clean. 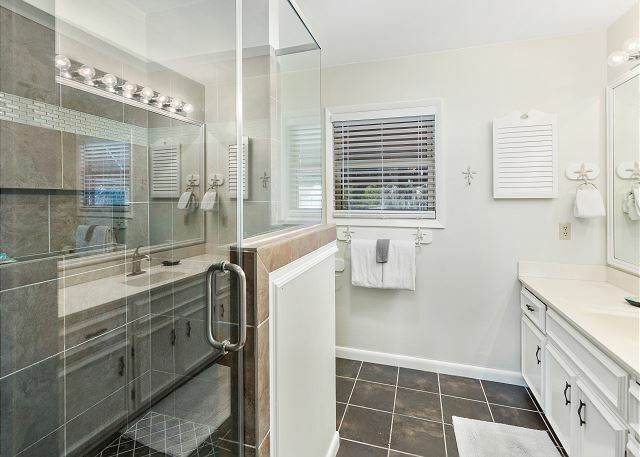 Awesome master shower and chairs on the deck to lay out in. I loved this property. It was compfortable and had the best views! We were right on the beach and could watch the ships coming/leaving port in Brunswick from our deck. My only concern was with the outside stairs which were the only way to enter/exit the property (they were wooden and open so I was afraid of slipping when it rained - but I didn't slip.). Other than the steps I loved this place!! Beds need to be updated. King bed would be nice. It would be nice if you would provide amenities like toilet paper, dish soap, adequate amount of dishwasher soap, alum. foil, saran wrap so we would not have to run to the store a couple of times during our vacation. Also, the toaster was a problem as was the stove (burners were hard to control the heat) and an addition of a blender would be nice. Nice job on the new showers !!! THE BEST EVER, MOST RELAXED WE HAVE BEEN, PERFECT LOCATION TO EVERYTHING, MARY AT REAL ESCAPES ALWAYS DOES A GREAT JOB FOR US AND HER STAFF.THANKS!!! The bed in the master bedroom sloped to the center. Overall this property was a great launching pad for a great vacation! Perfect for a family of four. Can easily prepare meals in the very nice kitchen or walk to the pier area and choose from numerous excellent restaurants. Our kids loved being on the beach and low tide provided hours of fun discovering.